How are you feeling ahead of kick-off? Following tonight in the hope "Trolls" don't spoil the occasion ! Up the Wolves ! Damn prescriptive. Afobe for the brace. ???? Come on lads; 3 points and a good show is order of the day. Adobe for a brace. Don't forget to log onto Wolves Player HD for full match commentary with @BurrowsMikey and Andy Thompson. thought Mcdonald was suspended, 5th yellow against Forest?????. 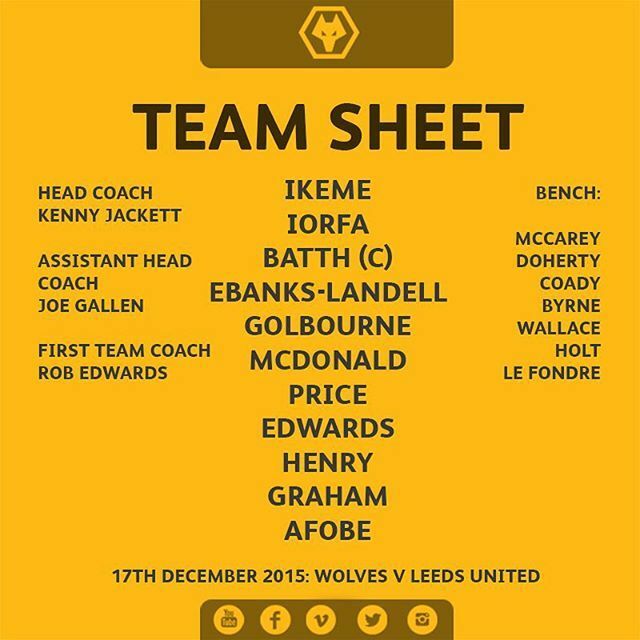 #lufc subs vs @OfficialWolves | Peacock-Farrell, Coyle, Bamba, Murphy, Mowatt, Doukara, Antenucci. #lufc team vs @OfficialWolves | Silvestri, Wootton, Bellusci, Cooper, Taylor, Byram, Cook, Adeyemi, Bridcutt, Dallas, Wood. just one out and out forward again, we are at home y'know. Good evening from a mild Molineux, where we are just over an hour away from kick off in the Sky Bet Championship clash with Leeds United. Myself and Otto are here to guide you through the action. Thanks again to @dudleyzoo for all their help and to the lads @DNouha @ZeliOfficial and Razak Boukari.